An air tool used for fixing trim carpentry. It is logical to see that in the sizes that they are made a staple gun will have a lot more grip than a brad or small nail of the same diameter and length. There is no argument at that. Of course nobody would use the same size nail as one leg of a staple, they would use a thicker gauge nail to get an equivalent grip. This may or may not cause splitting, but in terms of equal grip, a staple will always have less tendency to split the timber. They can be set so that the head of the staple is set below the surface in finish joinery work. The usual orientation then is to have the staple heads aligned with the grain of the timber. 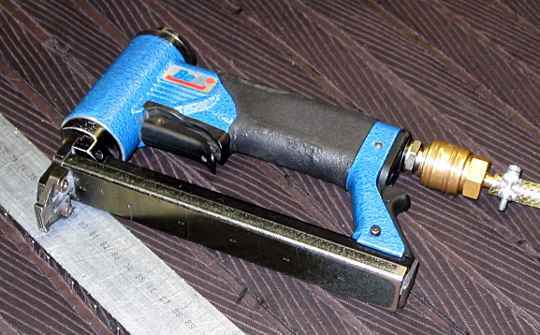 Staple guns are used in many applications. Furniture upholstery, trim carpentry, flooring etc. Some staplers have what is known as an oil-less motor that eliminates daily oiling but more importantly it stops oil splattering on work surfaces. They usually have a dry-fire lockout to extend motor life and prevent marring work surfaces with dry-fires. Another feature that manufactures like to build into these tools are no-mar pads at the contact points of the stapler and the work. This keeps work surfaces clean of tool marks.